"QUEEN - NEWS OF THE WORLD" 2017 EU 40th Anniversary edition box set. On VIRGIN EMI RECORDS label. A special box set of Queen's landmark 1977 album News of the World is here, marking the 40th anniversary of the original release. The new package includes the original album on CD, plus two further CDs of recently unearthed out-takes and rarities from the band's archives, one of which is a newly created alternative version of the whole album Raw Sessions. For many Queen devotees, this Raw Sessions CD will be the most intriguing component of the new release. Mined deep from long-vaulted studio multi-track tapes, this extraordinary parallel album brings to light never-before-heard alternative versions of each of the albums 11 tracks. Every lead vocal is different, as are most of the lead guitar parts and a great many other instrumental details. Here we experience We Are The Champions anew, with many unfamiliar vocal and instrumental elements, and for the first time at its full-recorded length rather than the edited 1977 album cut. Here also is the chance to discover peak era Freddie Mercury vocals on a track that nobody outside Queens inner circle has heard him sing before at all Brian Mays All Dead, All Dead. The original album version features May himself on vocals. Roger Taylors Sheer Heart Attack can be heard with its original long-lost guitar intro and uncut ending. Taylors other song, Fight From The Inside, is more remarkable in that we hear his demo vocal worked on in his home studio in preparation for the next sessions. Another outstanding feature of this weighty 40th anniversary box is a pure analogue re-cut of the original vinyl LP, direct from the unmastered analogue master mix tapes. There is also a rich selection of NOTW related memorabilia including three posters and a 60-page book of images, mostly previously unseen. The package is completed with a brand new one-hour DVD documentary, Queen : The American Dream, created from backstage material filmed during Queens 1977 USA News of the World tour. VINYL LP: News Of The World (New Pure Analogue Cut from the Original Master Tapes). 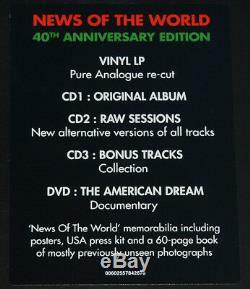 CD 1: News Of The World (2011 Bob Ludwig Remaster). DVD: Queen: The American Dream Brand new documentary featuring previously unreleased footage from Queens famous 1977 show in Houston, Texas (Running time approximately 60 minutes). 60 page hardcover book with previously unreleased photographs. Original News Of The World Press Kit featuring original album PR and 7 press photos. These charges are buyers responsibility. The item "QUEEN NEWS OF THE WORLD, 2017 EU 40TH ANNIVERSARY LP + 3CD + DVD BOX SET, NEW" is in sale since Sunday, December 2, 2018. This item is in the category "Music\Records". The seller is "c200sc" and is located in Athens, Attiki. This item can be shipped to North, South, or Latin America, all countries in Europe, all countries in continental Asia, Australia.